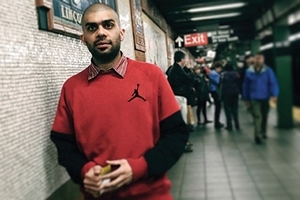 Born and raised in India, Karan Madhok is a self-described "die-hard basketball junkie, in love with everything hoops, from the cracked cement outdoor courts in Varanasi to the polished maple-wood court at Madison Square Garden." He is also a basketball journalist, an AU creative writing graduate student, and a budding novelist. Madhok has built a name for himself in sports journalism by focusing on basketball—specifically, basketball in India. He authors the Hoopistani basketball blog and is a regular contributor to NBA.com/India, SLAM magazine, SLAM China, SportsKeeda, Ekalavyas, and the Times of India. He's built a loyal following of thousands of readers and fellow Indian basketball enthusiasts across these publications and through his blog, podcasts, tweets, and Facebook posts. Madhok says he started writing about basketball at an opportune time. "Back then, no one else was covering grassroots basketball in India," he says. "Now, the NBA is sending its stars there. It wants the country to be the next big basketball market, similar to China, and there's so much excitement over the sport right now." But even before he developed his passion for basketball, Madhok was already writing. "I have been writing horrible short stories since I was eleven or twelve years old," he jokes. But he nearly missed his calling when he went to college in the United Kingdom and majored in computer science. Technology seemed like a safe career path for Madhok, but his heart wasn't in it, and he continued to take online fiction writing classes while studying computer science. He also kept writing after graduation, building his freelance career, and when his wife was offered a job in Washington, DC, he applied to American University's MFA Program in Creative Writing. While at AU, Madhok's writing path took another turn. He branched out into fiction, and he's hard at work on his first novel, with guidance from his advisors, Literature Professor David Keplinger, Professorial Lecturer Melissa Scholes Young, and Assistant Professor Dolen Perkins-Valdez. He expects to complete half the manuscript this spring, and it will serve as his thesis. Madhok is quick to point out that it's not a story about basketball, however. It focuses on a young Indian student who survives a heinous act, and it tells the story of the student and the larger world around him. Madhok says he is grateful to find so many like-minded people around him in American University's Creative Writing Program. "For a long time, it was difficult for me to find people who could inspire me to further my art," he says. "At AU, it's so great to be around others who share my obsessions."